it allows them to have custom work, so that they can have the final result like the one they need or like. 100% solid wood, white oak, red oak, ash, sapele, teak, walnut, cherry, mahogany, merbau, bubinga timber etc. to choose. 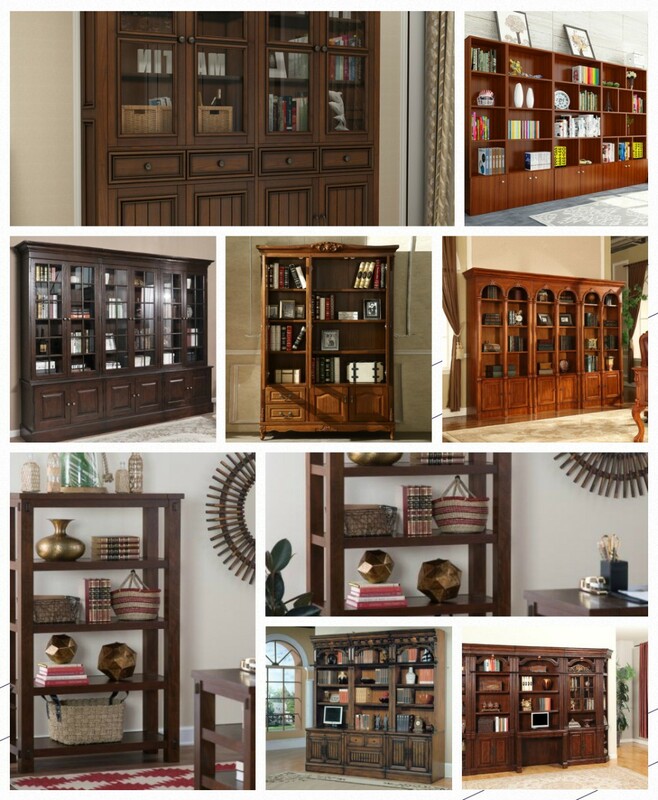 bookcase carcase, door leaf, glass wood door, Roman Header & Column, handle, hinges, wood desk etc. 1> Top Grade Wood Material: 100% solid wood, advanced ant proofing, vapour drying & finalization treatment, to control the moisture content during 8%~12%. 2> Wonderful Appearance: 7 times painting, smooth wood line, saturated color and gloss, fashionable style. 3> Environmental: 100% nature wood, non-poisonous and non-radiating, water-base painting. 4> Waterproof: anti-bacterial, mildew proof, anti-corrosion, non- deformation and non-warping, non-cracked and non-discolouring. 5> Easy to clean, Scratch resistant and corrosion resistant , acid and alkali resistant. 6> Good Cost Performance: middle price with high quality. 7> Customized design and Size available. OEM, ODM available. Elegant and streamlined bookcase serve the purpose of storing and organizing the books while decorating your interior in a modern manner. Live in style with modern bookcases and precious collection of books and real lovely stories while you inhale the sweet smell of natural paper and wood. 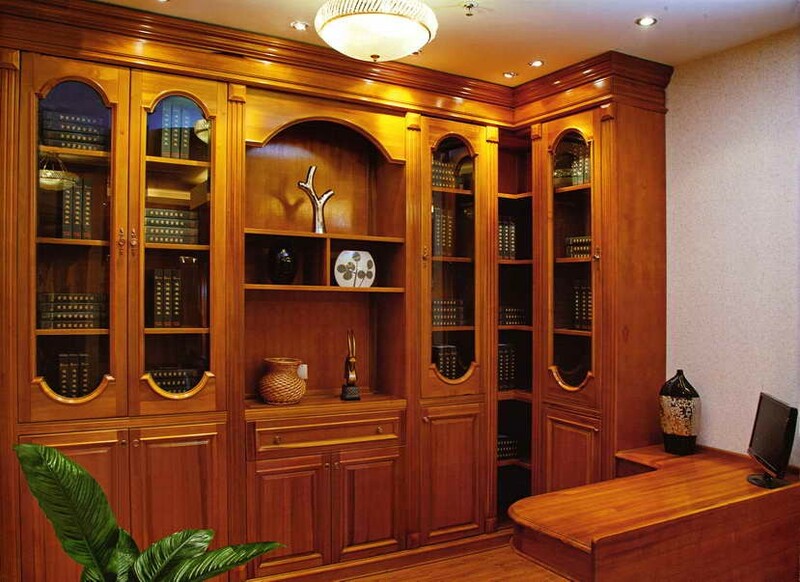 1> Brand Advantage: Top-ten Brand in Guangdong Wood Furniture Industrial, AAA Grade Quality. Ten Trusted Building Material in Wood Market. 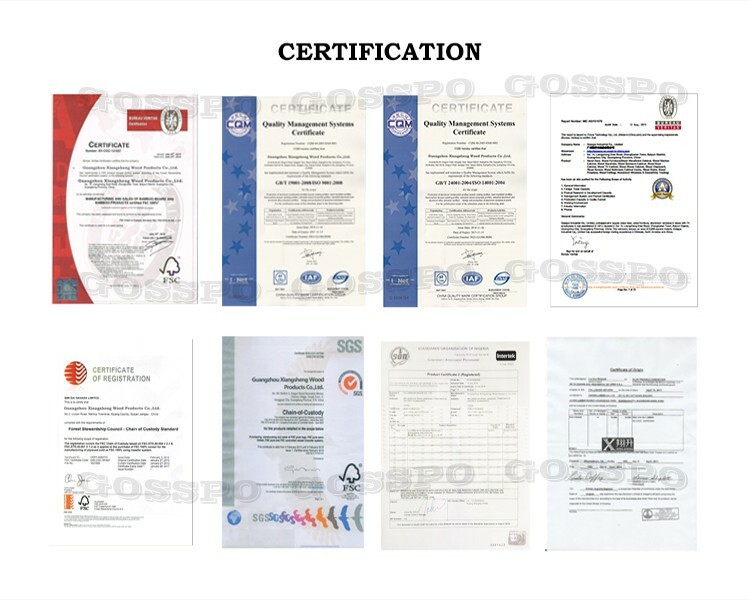 3> Production Advantage: ISO9001 certification, occupy 30000 square meters factory, advanced equipment, 9 main technics, 128 procedure, to make the craft products. 4> Management Advantage: attract many professional designer, marketing and enterprise management talents, gather lots of skilled workers. 5> Marketing Advantage: Our products have exported to Europe, Canada, America, Australia, Hongkong, Middle East and Africa. 1> 10 years professional experiences in wood furniture industry. 2> Our wood furniture could be used for at least 30 years. 3> The guarantee for the after sale door is one year. 5> Send QC in factory for quality control and final inspection before shipping. 7> Warranty assurance: GOSSPO will be responsible for any problem. 8> Experienced sales service and suggestion. 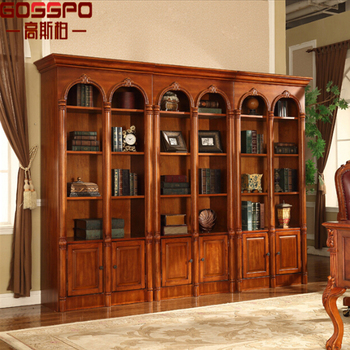 1> What’s kind of material does GOSSPO use for the wood wardrobe/ wood wine cabinet/wood bookcase/ wood cabinet? 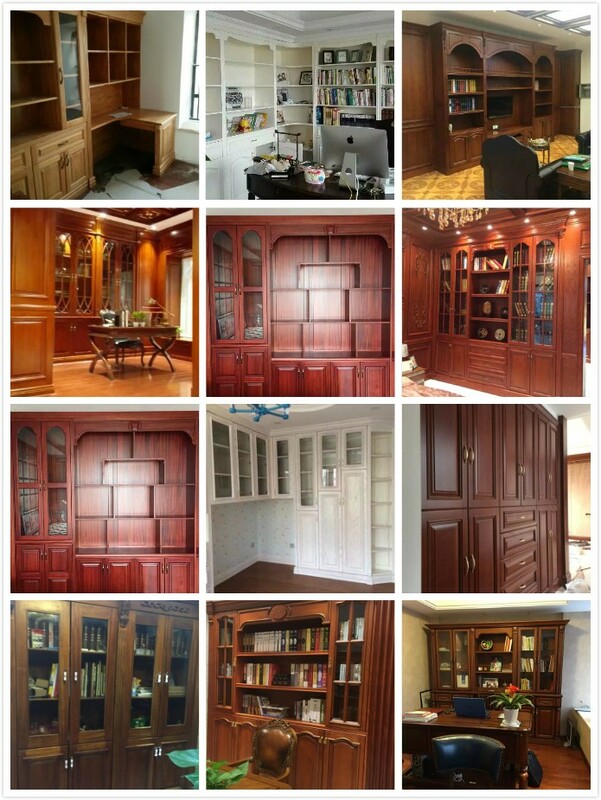 Our wood cabinet are 100% solid wood made, have lots of natural wood to choose: Thailand white oak, Africa Sapele, black cherry, ash, walnut, teak, America red oak, Indonesia Merbau etc., or you can choose the costly plywood with painting solid wood color. 2> What’s the surface treatment for GOSSPO wood cabinet? We do 7 times painting, one time painting matched one time sanding, use the good quality and famous brand paint, to get the smooth wood line, saturated color and gloss, non-discolouring. 3> Does your GOSSPO wood furniture natural and Environmental? Yes. We use the 100% nature wood, and we adopt the international popular water-base painting. non-poisonous and non-radiating. Easy to clean. 4> How does your wood furniture to get non-cracked, non- deformation and non-warping? All our wood material are imported, and have treated by the professional factory, advanced ant proofing, vapour drying & finalization treatment, to control the moisture content during 8%~12%. By this way to get the wonderful performance. 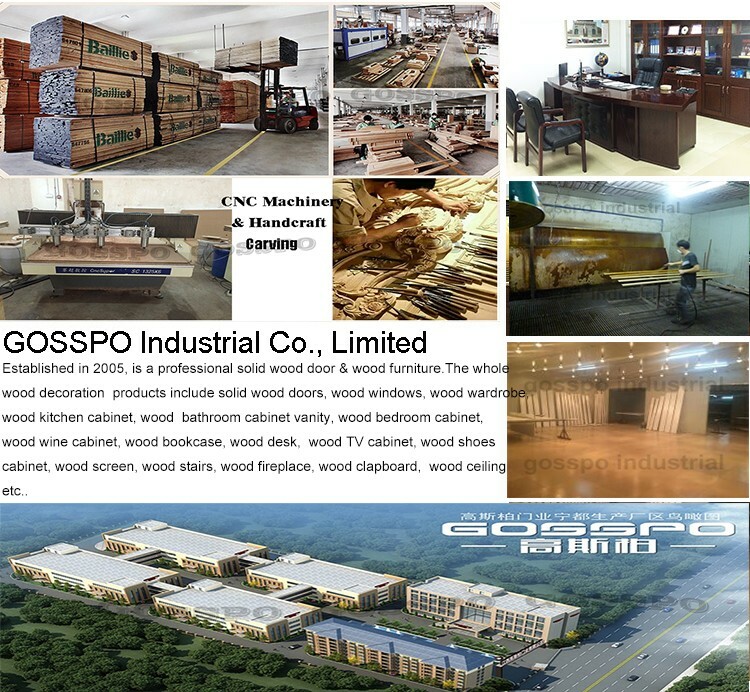 5> How about the after service of GOSSPO wood funiture? We will supply 1 year warranty maintenance after service, we can supply the small pieces paint bottle free to maintain the color removed caused by loading and unloading, installation. As for other problem, like size, color, design, quantity, quality different with the contract, we will take responsibility for our products if our mistakes, and discuss with the customer to fix a satisfied solution. If caused by customer’s mistake, we also will help the customer to find the easy and costly way to make least lose. 6> Can the logo or company name to be printed on the products or package? Sure. Your logo or company name can be printed on your products. OEM and ODM are available. 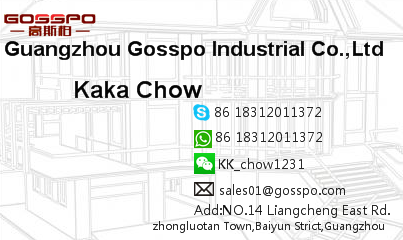 7> Can the customer provide the design and size, GOSSPO customized? Sure. Any customers design and size can be customized, our professional designers and engineers team will combined with our production of the feasibility of the technology to make a good solution for you.